An Americana band from Sheffield? Can that be a genuine thing? As it turns out, the answer is a resounding yes. With the release of their second full-length album, The Payroll Union have established themselves as serious contenders in the indie folk genre as well as honing a more specific proficiency in analyzing U.S. history by using a style of music that is typically associated with America. The band’s first two EPs, ‘Underfed and Underpaid’ and ‘Your Obedient Servant’, both released in 2011, established the foundational exploration of American history that continues to inform their work, including 2013 debut LP ‘The Mule and The Elephant’ and their new album ‘Paris of America’. The album’s title refers to the city of Philadelphia, nicknamed the “Athens of America” for its cultural and political atmosphere in the time period immediately following the American Revolution. Philadelphia’s history took a violent turn in the so-called ‘riot era’ of the 1830s and 1840s, when eruptions of hostility and aggression fed by racial, social and economic upheaval agitated the city in what might be considered aftershocks of the revolution in France some 50 years earlier. The Payroll Union’s academic and artistic endeavours in the making of ‘Paris of America’ were supported by the Arts Enterprise project at the University of Sheffield, which led the band’s lead singer and songwriter Pete David to collaborate with filmmakers, illustrators, other musicians and most notably historian Dr. Andrew Heath, on a project titled ‘Faith and Fear in Philadelphia’. Thematically, the songs on ‘Paris of America’ take an alternative and character-specific approach to illustrating the anguish and turmoil of the time period, telling deeply emotional stories with careful and fascinating attention to detail. Musically, there is a strong and unsettling sense of dramatic tension throughout the album. Anxiously persistent bass and percussion rhythms buttress piercing electric guitar riffs and the deep, menacing baritone of David’s vocals, which are particularly effective in the recurrent moments of fire and brimstone imagery. The album’s opening track ‘The Ballad of George Shiffler’ takes on the passionate perspective of Nativist militants vowing revenge for the killing of one of their young members in an anti-Catholic riot. The final verse is a broad call to arms, “do not remain in mourning long, the fighting does not cease / we’ll pull down every headstone, whether commodore or priest / so sing this song for years to come, George Shiffler is his name / a gentleman, American, who fought the papists’ claim”, while the chorus, “we light the sky” is an anthemic rallying cry. While most of the tracks on ‘Paris of America’ are forcefully immediate in their passion and fervor, ‘Winter of ‘41’ is, by necessity, a bit more introspective, though no less dramatic than the others, as it details author James Fennimore Cooper’s account of an unusually long and bitterly cold winter that brought Philadelphia to a standstill. The song’s slow 8-minute evolution starts with a delicate, ethereal keyboard melody under through-composed verses that seem somehow appropriate to the poetry of the time period: “The winter of ’41, it lasted oh so long, it lasted through the spring / we almost weakened in the frost, frozen in our fear, paralysed by loss”. First single ‘The Mission Field’ is the jaded narrative of a Protestant minister, who points out the sin and depravity of the people he is tasked to save. The turbulent percussion tumbles through his multifaceted examination of how civil unrest has affected the city of Philadelphia, exposing personal flaws to daylight and judgment before descending into a chaotic milieu of background vocals. After exploring the growing divide between Philadelphia’s social classes in ‘Wo Unto Sodom’ and ‘Blood or Bread’, the album looks ahead in history to an even greater period of unrest, the American Civil War. Its final track is a resigned and melancholy piano ballad called ‘The 6th’, which refers to a regiment of black soldiers who volunteered to join the fight for their freedom. As you have probably already deduced, ‘Paris of America’ isn’t an album designed for casual Sunday afternoon listening. Though the songs fully elucidate the context of historical drama and tension all on their own, their sophisticated level of detail will likely inspire, or indeed require, a bit of background research for listeners who are unfamiliar. The Payroll Union have with this album proved a remarkably high level of dedication to both the intellectual and emotional aspects of their craft with character portrayals that are both historically accurate and, at the heart of it all, profoundly human. 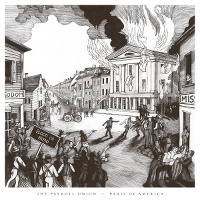 The Payroll Union’s second album ‘Paris of America’ is out now via Backwater Collective.